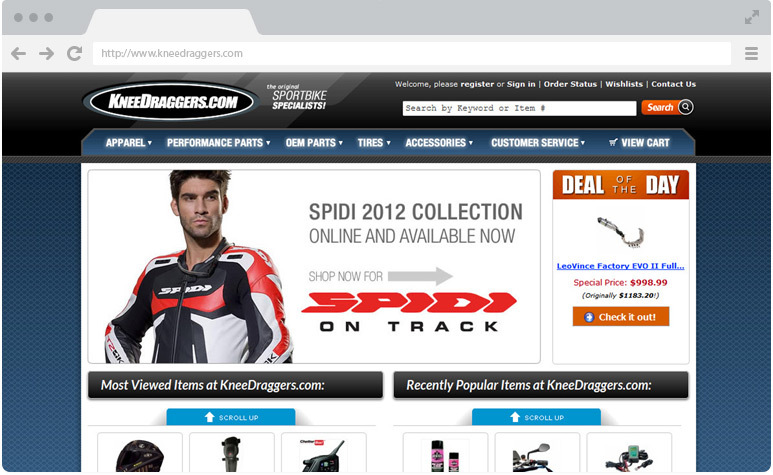 For over ten years, KneeDraggers.com was known as the internet's premier retailer of aftermarket sportbike parts & accessories. I called it home for at least eight of those years, and the last title I held there was CTO (Chief Technical Officer). KneeDraggers ran a LAMP stack on several custom Debian boxes and daily upkeep of the website, database, layout, graphics, email marketing, SEO and site performance were just a few of the many responsibilities of my position. I was the default photo guy, tech support guy and I also built a lot of computers. Some were Windows PC's for the sales and shipping teams and some were linux boxes that ran backups, inventory updates and the local employee intranet. Wiring, maintaining and troubleshooting the wired and wireless networks was also part of my routine, and at one point in 2008 I even learned how to operate an embroidery machine. Website duties also included managing a team of six remote employees in India who helped enter the massive parts and image updates every few months. The powersports industry is well known for their gigantic catalogs which are thicker than most encyclopedias - and we received dozens of these catalogs every six months. Keeping the landslide of content fresh, up-to-date and accurate was one of the biggest challenges we faced. I used to joke about it being like this scene from Seinfeld. I worked hand-in-hand with several great programmers during my tenure at KD. Chris Finlay, Andre Ferriera and Jeff McCoy all helped develop and maintain some very unique real-time inventory & stock systems, back-end management interfaces, logistical shipping algorithms and shopping cart features. 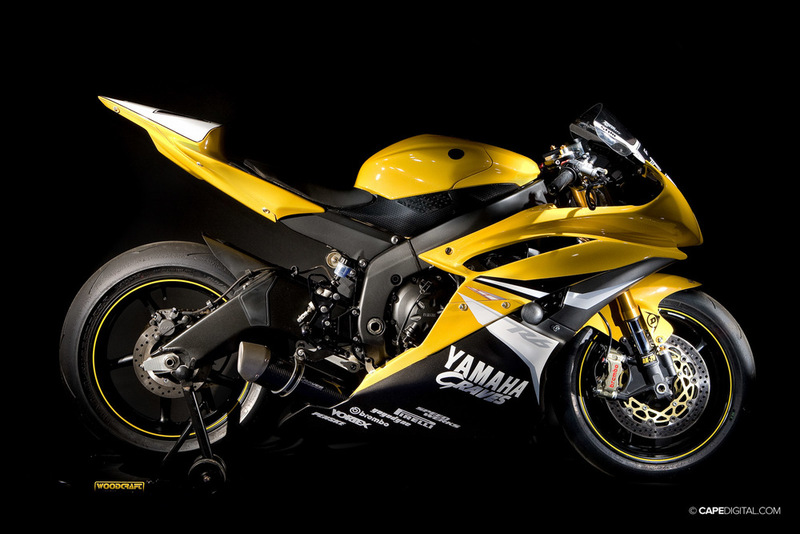 We'd collaborate daily (usually remotely) and come up with new ways to get people their motorcycle gear faster. They took care of the backend, I managed the frontend and made it look pretty. 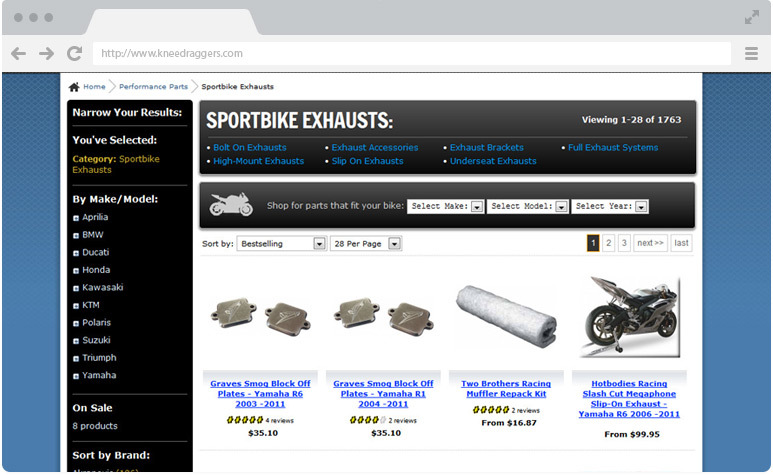 KneeDraggers was featured in the Internet Retailer's "Top 500" list for several years in a row and was a profitable, multi-million dollar e-commerce business for many, many years. 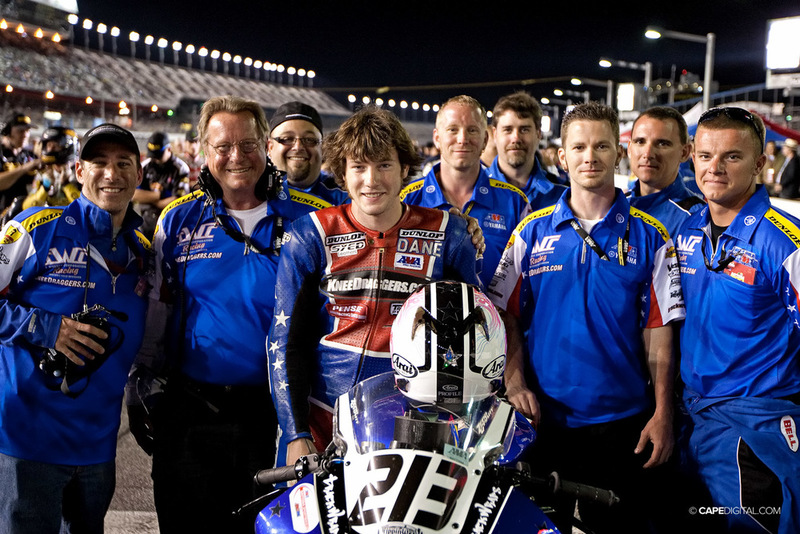 In late 2011 the owner and CEO (Sam Lehrfeld) sold the company to MotoSport.com, however the knowledge, experiences and friends I had there will never be forgotten. Dane Westby, you will be missed.